Eating pie on Pi Day. 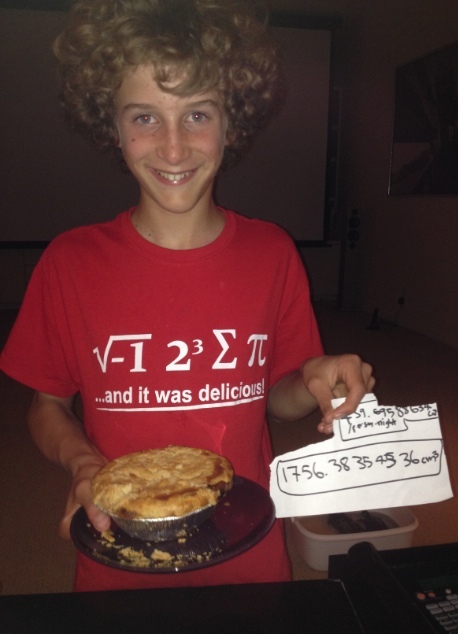 For the mathematically rusty, Max’s T-shirt says: “i 8 sum pi… and it was delicious.” And the sheet of paper shows the volume of the pie he ate. Using π.
Saturday was Pi Day. At least, it was in America, where the date was written backwards as 3/14. In Britain there will never be a pi day because pi = 3.1415926535… and there won’t be a 3rd day in a 14th month. There was a π day last year too, but something different happened this year. There was more publicity and more media hype, and more T-shirts were sold. I suspect most of the reason for that was that it’s 2015, so the date wasn’t just 3/14, but 3/14/15 – the first 5 digits of pi. And there was an infinitesimally brief moment just after 9.26 and 53 seconds when Pi Instant occurred, all the way through to the end of its never-ending decimal places. Or maybe the reason that Pi Day was bigger this year was that the country’s pie-lovers and pie-makers wanted more pie. Pi Day became the excuse for a Pie Party. Thanks Natalie. That’s lovely. It’s annoying we miss out on Pi day! Love Max’s T-shirt. For some reason, in this photo Max looks as if I don’t feed him. Maybe it’s the light. He’s really not as skinny as this would suggest.